2017 is alive and kicking. Just last week, Nanjing Imperiosus Technology Co., Ltd. (also known as DomainersChoice.com), an ICANN-accredited registrar, received a Notice of Termination of Accreditation Agreement from ICANN. LegitScript has been monitoring Nanjing Imperiosus for a while now. Nanjing is a registrar based in China, affiliated with Israeli registrar CommuniGal Communication Ltd., and operated by German national, Stefan Hansmann. The registrar’s portfolio includes over 27,000 domain names. 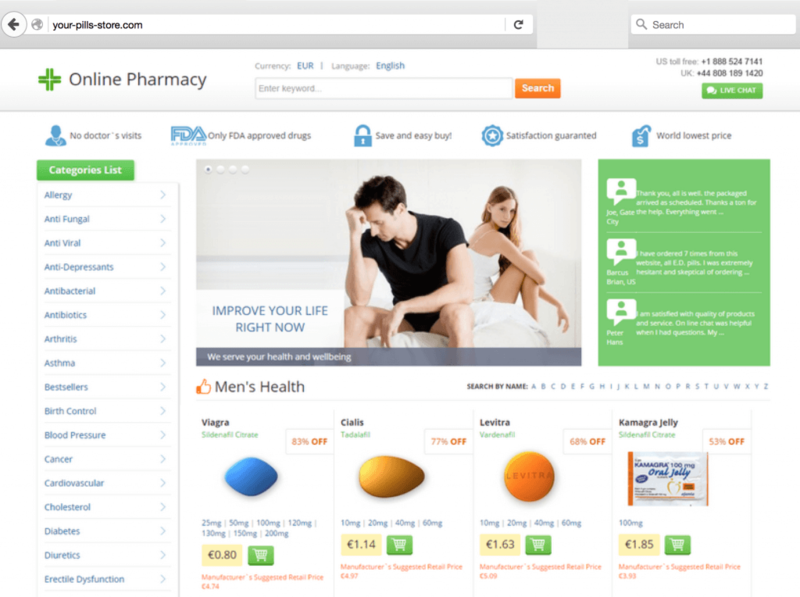 Of these, several thousand were identified by LegitScript’s analysts as rogue internet pharmacies, or websites engaged in illegal or infringing activity — a substantial portion of the registrar’s business. Last month, the White House Trade Representative, Notorious Markets report called out Nanjing Imperiosus as its example of a rogue registrar. 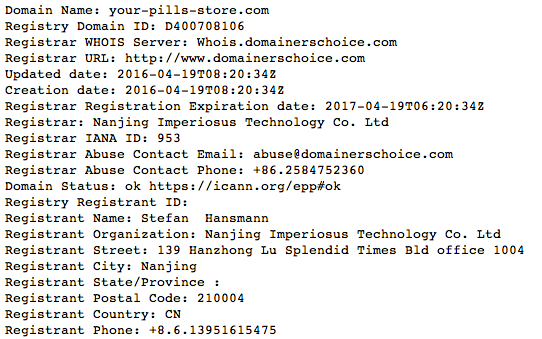 LegitScript is not the only company that has noticed the nefarious activities of Mr. Hansmann and Nanjing Imperiosus. Just this month, the registrar was ranked No. 2 on Spamhaus’ list of registrars with the worst reputation for spam domain names. Spamhaus reviewed 14,141 of Nanjing Imperiosus' domain names, and found 99.2 percent were bad. In a January 3rd, 2017 report, Knujon recorded 1,703 abusive domain names sponsored by the registrar. Cisco also featured Nanjing Imperiosus in a 2015 presentation, “It Is 2015, Why Do We Keep Getting Hacked?” The Cisco presentation included evidence of typo-squatting by Nanjing Imperiosus, and sponsored domain names of the registrar delivering malware. Over the last several months, LegitScript’s abuse team submitted multiple abuse notifications to Nanjing Imperiosus. These notifications contained over 2,500 rogue internet pharmacies — most of which are still online and operating illegally, posing a significant risk to public health worldwide. It's worth calling out that the first breach of contract listed in ICANN’s Notice of Termination of Accreditation Agreement is Nanjing Imperiosus’ failure to provide records to ICANN related to abuse reports, as required by Section 3.18.3 of the RAA. Does this evince a new day dawning at ICANN Compliance, which LegitScript has criticized for a secret compliance process that in some cases gives registrars a green light to sponsor criminal activity? (As we've noted, when ICANN is asked what the registrar did that constituted contractual compliance in such cases, they state that it’s a secret between them and the registrar — Kafka in reverse.) Certainly, LegitScript is appreciative of the Nanjing decision and applauds it. But just yesterday, ICANN closed yet another complaint against Rebel regarding alldaychemist.com, a rogue internet pharmacy, finding that Rebel “demonstrated that it took reasonable and prompt steps to investigate and respond appropriately to the report of abuse” despite Rebel seemingly having done nothing. If asked what Rebel did that constituted an appropriate response to our complaint, ICANN will insist that it’s a secret and can't be disclosed. What’s offensive here isn’t just ICANN giving a pass to Rebel; it’s the secrecy, which results in ICANN granting protection to a criminal-friendly registrar. But back to Nanjing: what happens next? By January 11th, 2017, Nanjing Imperiosus needs to designate a chosen ICANN-accredited registrar to bulk transfer its domain name portfolio. A word of caution to any registrar considering taking on Nanjing Imperiosus’ portfolio - it is dirty, very dirty. LegitScript is happy to offer help in reviewing and cleaning up their portfolio, but we doubt it can be remedied. If you do choose to take on Nanjing Imperiosus' portfolio, be advised that it may be more trouble than it’s worth.